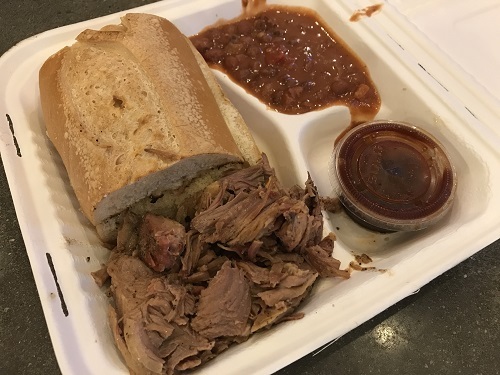 The Old San Luis BBQ Company, located at 670 Higuera Street just off Nipomo Street, is easy to spot from the street and has a large metered parking lot to make it easy to visit this downtown San Luis Obispo eatery. Just look for the walk-up order window and get started. Why We Like It: The Old San Luis BBQ is a nice surprise, combining the convenience of ordering at the window and quick service (great if you need some BBQ for take-out) with the option of sitting inside one of two dining areas and enjoying the unique self-serve taps with dinner. The taproom is also a nice, easy place to grab a beverage of choice—dozens of beers plus a few wines and hard ciders (including local brands)—and just relax or create your own happy hour with friends. This is one of the cool features of this restaurant, and it’s one of only two places in SLO county with this new technology. At first it’s a bit confusing, and potentially overwhelming. But when you get the hang of it, it’s great fun to explore all the options. Old San Luis BBQ’s cutting-edge taproom has 46 taps lining the long, white-tiled wall that serve dozens of craft beers plus between four and six wines and two to four hard ciders, including options from local companies. During one visit, local wineries on tap included Castoro Cellars, Chamisal, and Troublemaker. Here’s how the taproom works. Walk up to the order window and ask to open a tab for the taproom. They’ll take your credit card (don’t worry; you’ll get it back) and give you a microchipped tap card. Just insert the card in the slot above each tap, pull the lever, and watch your glass fill as the pennies count up—just like at the gas pump. In teeny type on each sign, you’ll see the price per ounce for each selection. 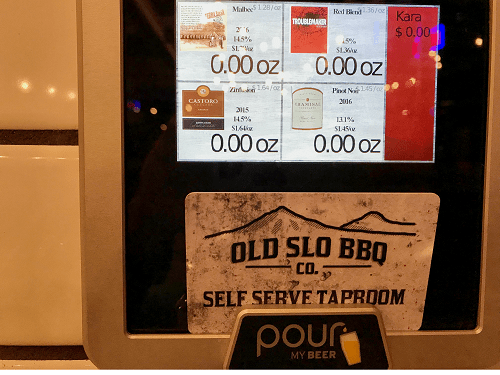 The self-serve taproom uses an easy-to-use card to unlock your full beverage-enjoyment potential. The taps for beer are self-explanatory, as there’s just one lever per beer. 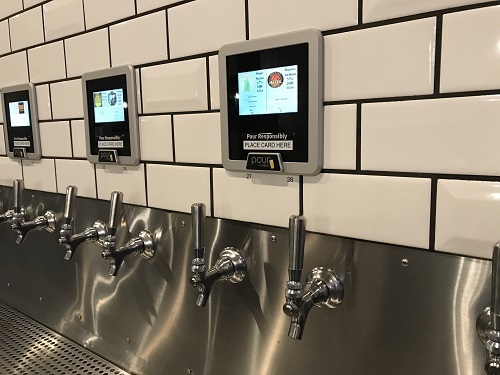 The wine and cider taps have four options per sign and four different taps, so it can be a little challenging to know what which tap is connected which of the four choices when you pull a lever. But that’s part of the fun. Just channel your inner Forrest Gump (you never know what you’re gonna get) and go for it. Another great thing about the tap room is that you can try tastes of a bunch of things. You don’t have buy a whole glass of anything (unless you want to). Think of it as your own private tasting flight. If you’ve ordered food along with the tap card, when you’re finished you can pay for everything at the same time. It’s a fun system with such a wide range of beer, wine, and hard cider choices. The Pit Plate with pulled pork and Santa Maria pinquinto beans. Owner Matt Pearce graduated from Cal Poly and his goal has always been to give back to the community by serving classic Central Coast barbeque at fair prices. He also gives discounts to downtown employees, students, and clubs. 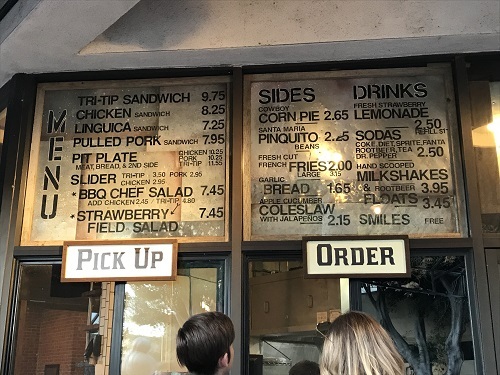 The menu is small but on point to feature Old SLO BBQ’s focus on Santa Maria-style barbequed tri tip, chicken, linquica sausage, and tender pulled pork. Sandwiches can be ordered with any of the meats, and the Pit Plate includes choice of meat, bread, and a side. Sides range from fresh-cut french fries and sweet potato fries to Santa Maria pinquinto beans made with ham, bacon, and spices, and a deliciously different cole slaw with apple, cucumber, and a little kick from jalapenos. Another side we haven’t tried is the Cowboy Corn Pie, a family recipe with cheddar cheese and jalapenos. They also offer two salads: chef salad and strawberry fields. Those are on the list to try during our next visit. Nonalcoholic drinks include fresh strawberry lemonade. And dessert? Hand-scooped milkshakes. The staff is knowledgeable about gluten-free options and offers alternatives—like a second side with the Pit Plate as a substitute for the bread. By the way, smiles are free (it even says so on the menu). 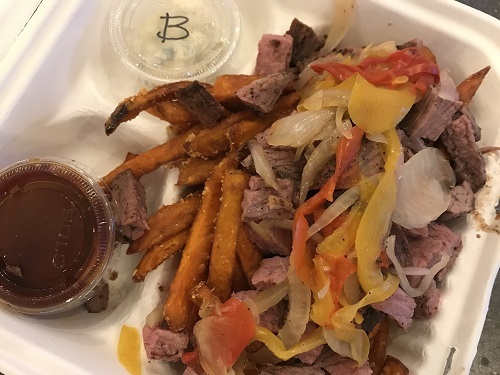 Ask for The Mark (click to see the goodness) and you’ll get this secret treasure of sweet potato fries topped with grilled onions and peppers, plus your choice of 3 or 6 ounces of tri tip. Blue cheese crumbles and barbeque sauce on the side let you create the perfect taste for you. The order window is conveniently located at the front entrance just off Higuera Street. 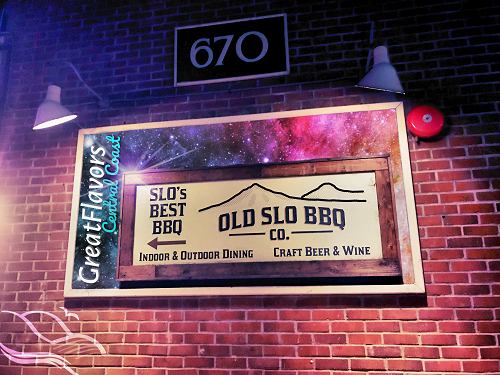 All in all, we like this BBQ restaurant where we can quickly put in an order for take-out or relax for a while in the taproom to enjoy some good food and company. They’re open every day at 11:00 am. The taproom stays open until 10:00 pm, and the restaurant is open late Friday and Saturday nights. Explore more destinations on our Central Coast Map! Looking for more places to explore in the Central Coast and San Luis Obispo? Use our interactive map to read our articles from in around the city. Click the map icons and then the article link! Do you have a flavorite place we haven’t listed? Please email your suggestions so we can check it out and add a pin in the future, and shoot us your comments and any eagle-eyed error spotting to engage@gr8flavors.com.